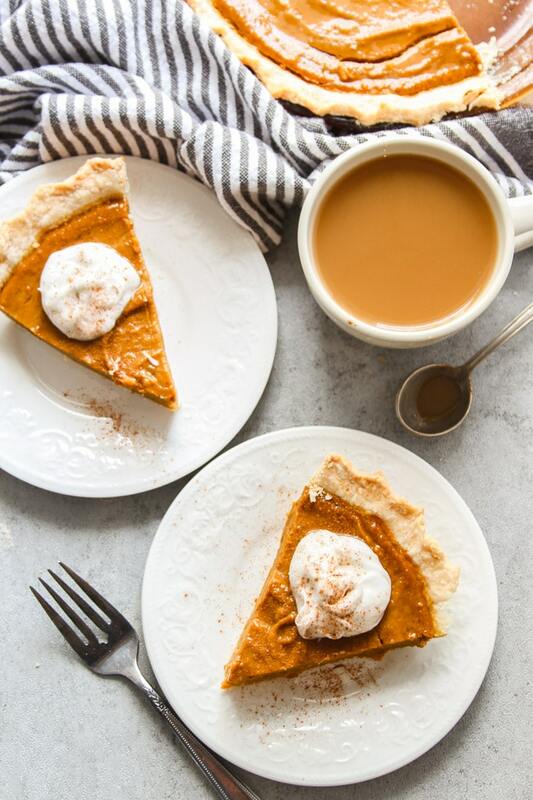 The best pumpkin pie you ever ate, and it just happens to be vegan! 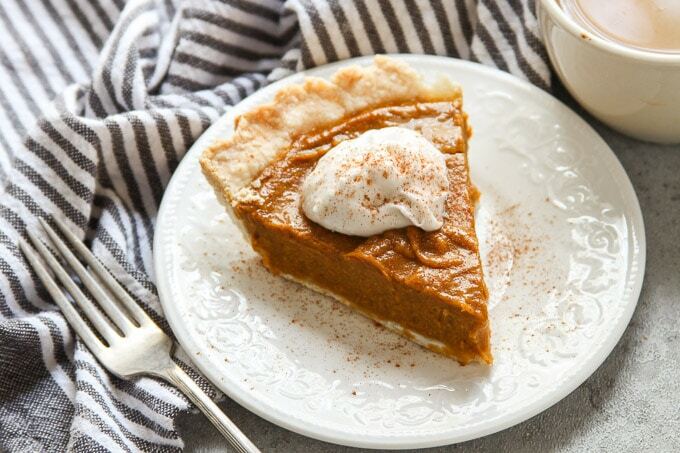 This luscious pie is rich, custardy, and packed with pumpkin spice flavor. A must for your holiday table. I realize I’ve been hitting the pumpkin ridiculously hard this year. What can I say for myself? See, there’s kind of vicious cycle that starts when I crack open a can of pumpkin. I use half of it, then I need to think of a use for the other half, but I end up having to open a new can for just a tablespoon or so, and before I realize it I’ve posted a half dozen pumpkin recipes in one season. But this recipe calls for exactly one can, so I guess I have no excuse. Except that I couldn’t possibly let one more Thanksgiving pass without finally sharing a vegan pumpkin pie recipe. I promise, after this, I’ll take a break from pumpkin. I think. I’ve had a lot of requests for vegan pumpkin pie over the years, and that’s one of the reasons it had to be done. Also though, it’s just really easy to make. Like, stupidly easy. 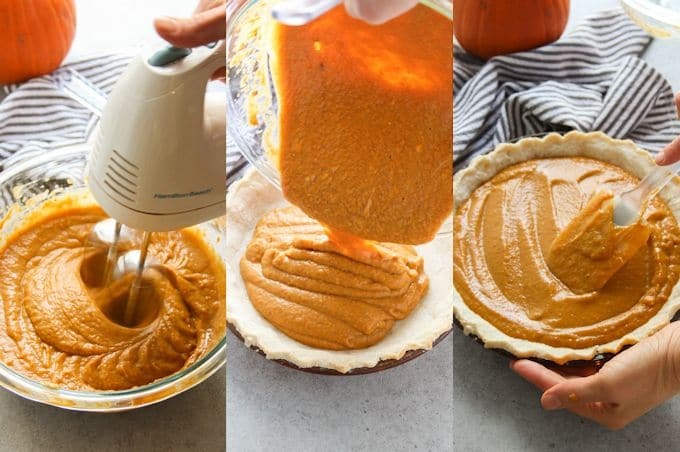 Back when I was new to vegan cooking I would’ve thought replicating that custardy texture you normally get from eggs in a pumpkin pie would be impossible. But guys, it’s the simplest thing: cornstarch. I’ve been using cornstarch as an egg substitute for years (even in other types of pies), and this finally hit me. I decided to see how it would do with pumpkin, and it worked like a charm! This pie was rich and perfectly creamy. I even fed this to a non vegan who proclaimed himself to be a pumpkin pie expert and promised to give an honest assessment. He told me it was the best pumpkin pie he ever had. Sweet! First, you’ll need to get yourself a pie crust. There are lots of store-bought pie crusts that are accidentally vegan, but I also have a killer vegan pie crust recipe that just happens to be pretty easy. The choice is yours. Blind baking is just a fancy word for pre-baking. Some pumpkin pie recipes call for you to just fill your crust up raw and bake it, but I find it comes out much better (as in, not soggy) when you give a brief bake first. 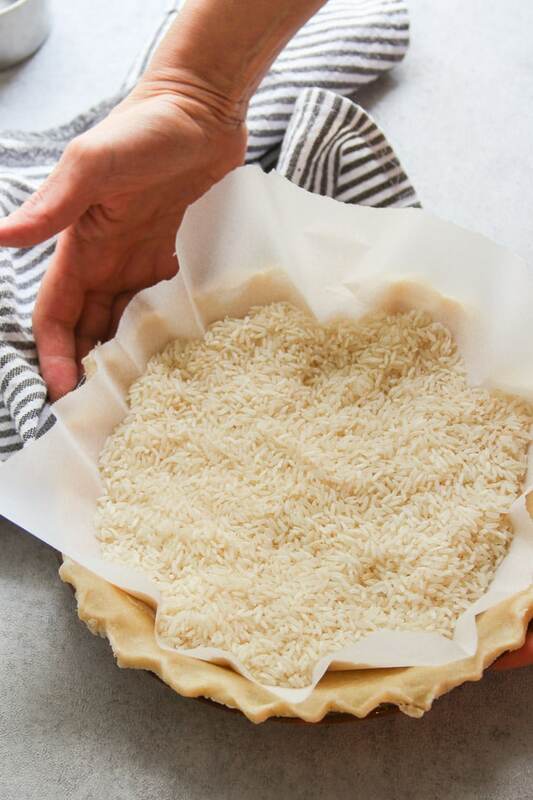 Poke your crust with a few holes, line it with parchment paper, and fill it with pie weights, dried rice or beans. Unfortunately, if you use rice or beans you won’t be able to eat them later. But you can reuse them for pie weights in the future. 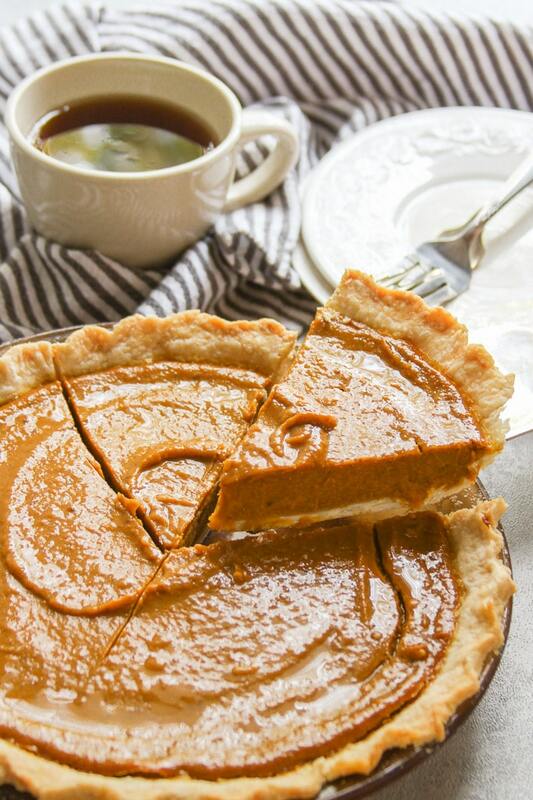 Tip: This is a great excuse to make more pumpkin pie. While your crust bakes, mix up the filling. All you need to do is beat the ingredients together with an electric mixer. Once it’s nice and smooth, pour it into your crust and bake your pie. Let the pie cool completely before cutting it. It’ll continue to firm up a bit as it does. This recipe calls for full-fat coconut milk. You can substitute light coconut milk or another non-dairy milk if you like, but the pie won’t be as rich. 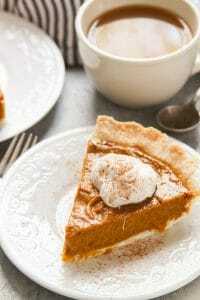 How long will my vegan pumpkin pie keep? This pie will keep for about 3 days in the fridge. You can also seal it up and freeze it for two months or so. Plan ahead so your pie has plenty of time to cool and fully set. In fact, I recommend making this a day ahead and storing it in the fridge. I really like to serve my pie with the whipped coconut cream from this recipe. A scoop of vegan vanilla ice cream makes a nice topping as well. Use a knife to poke a few holes in the bottom of the pie crust. Line the inside of the crust with a sheet of parchment paper, then fill it with pie weights, dried beans, or rice. Place the crust into the oven and bake it for 15 minutes. While the crust bakes, place the pumpkin, brown sugar, white sugar, coconut milk, cornstarch, pumpkin pie spice, vanilla and salt into a large mixing bowl. Use an electric mixer to beat the mixture until fully blended, smooth and creamy, about 2 minutes. When the crust has finished baking, pour the pumpkin mixture into it and smooth out the top with a spatula. Place the pie into the oven and turn the temperature down to 350°. Bake the pie until the center is just set, about 50 minutes. Serve with whipped coconut cream or vegan vanilla ice cream. Does using coconut milk give it a coconut flavor after baking? Does the pie “have to have” sugar in it? Can Stevia be used? I’m not sure if Stevia would work, but I suspect the sugar helps the pie to set. You might be better off going with something like erythritol. 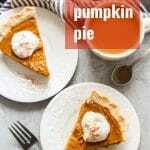 This is the best pumpkin pie ever!! Everyone loves it! Thank you for the recipe! Yay!! I’m so glad it’s a hit!! Hmmmm…that’s odd! It should be rather thick. I hope it turned out all right! I was attracted to this site because it says connoisseurs vegan which is what I am as a vegan cook. I collect secret ingredients from classic cooking text and places like America’s Test Kitchen. My comment about your pumpkin pie recipe, which I will try, is that if you can it is best to cut Kabocha squash into big pieces and roast under broiler then peel and puree. Plus about 1/4 cup of a baked and pureed Garnet Yam. These are the best ingredients if you’re going for the best taste in the filling. Sounds tasty – I love kabocha squash! You can imagine my excitement when I read this recipe and realized I had EVERYTHING I needed! This recipe is delicious and one that I will make again and again. Thank you so much. That’s so nice of you to make a pie for your daughter’s teacher! I hope it’s a hit! Hello! I just made this pie and it was absolutely delicious. I made it with a Graham cracker crust I bought from the store and substituted soy milk for coconut milk just because I already had it. This is my first ever pumpkin pie I’ve made myself and I couldn’t be happier with the result. I definitely recommend this recipe and I felt great knowing it didn’t have dairy in it (I can’t have milk). Huge win for my house and my husband also loved it. Thanks so much! I’m so glad you enjoyed it!! I bet the graham cracker crust was awesome with this! I love pumpkin pie! Looks absolutely amazing! I’ve been baking pies of all kinds and sizes for years. Is this for an 8″ pie? 9″? 10″? Would you point out where that’s stated….if it’s not specified, I do think it should be. Thank you! It keeps very well in the fridge for about 3 days and I think it should freeze just fine. I actually have a couple slices in the freezer right now, but I haven’t thawed them yet so I can’t confirm! Hi – Should I use canned coconut milk? If so, should it be refrigerated ahead of time? Do I use only one part of what separates? Hi Nicole! Yup, canned coconut milk works best in this recipe, although the kind in the carton will work as well. No need to refrigerate it. If it happens to separate on it’s own just stir it together as well as you can. Enjoy!! I’m in the process of making a vegan thanksgiving. I’m making this pie! Not even baked yet and the pie filling is perfection. Can’t taste the coconut milk. I look forward to the final product. I’m not sure if coconut cream will work. It might make the pie very dense! Made this for Thanksgiving this year and it was perfect! My omnivorous family said it was more flavorful than the conventional pumpkin pie made according to the recipe on the can. I used a store-bought accidentally vegan regular (not deep dish) pie crust and otherwise followed the recipe exactly. The pie set perfectly (I made it the day before and refrigerated it overnight, just in case it was runny, but it looked set right out of the oven) and there was no detectable coconut flavor. This recipe is a keeper and I will be making it again! Thanks! I’m so glad it was a hit!! Thanks Lindsey! This pie was excellent! If you didn’t tell anyone, they would not know it had no eggs or dairy; unless you use coconut milk “whipped cream”, the pie on its own has no discernible coconut flavor. Thank you, it’s a keeper! I’m going to make this recipe for Xmas dinner this year. Only question is regarding the “pie weights”. Is this necessary? I’ve pre-baked store bought pie crusts before and didn’t use this method. Never heard of it, in fact. Thanks! Interesting! I’ve always gotten big bubbles in my homemade crust when I tried skipping them. Perhaps with store bought crusts there’s a better seal between the pan and the dough. In any event, if you’re using a store bought crust and you’ve skipped the weights before, then I say go for it. If using a homemade crust, I’d use the weights to be on the safe side. I hope you enjoy this! Can a 9 inch store bought frozen deep dish pie crust be used for this recipe? It will – you might just have a little extra room inside the crust! I’ve made this twice now and everyone loves it! The first time, I couldn’t find a store-bought vegan pie crust, so I tried your Vegan Pie Crust (Made with Coconut Oil) recipe. I’ve never been able to get pie crust right, and this was no exception–came out too thick, hard, and greasy, but it tasted good. I only have deep-dish pie plates, so I quadruple the recipe to get enough custard to fill two pies. The consistency might be a touch too creamy right in the middle because of the extra filling, but it’s sooo tasty! I had a little filling leftover from Thanksgiving, so I froze it and added it to the Christmas batch. Freezing seemed to change the color slightly but not the taste. So-Delicious Coco Whip topping makes it even better!